American artist Dennis Oppenheim uses the photograph as a tool to document a specific action carried out away from the confines of a studio or gallery space. As two-dimensional objects his photographs represent four-dimensional artworks, with time as the fourth dimension. They act like mental ‘hotlinks’: understanding the concept is dependent on an extended description of the specific action. For instance, in ‘Directed seeding – cancelled crop’ 1969 (AGNSW collection), Oppenheim started with a curved line drawn on a map which outlined the road between a field in Finsterwolde, in the Netherlands, and the nearest grain storage silo in Nieuweschans. This curved line was then plotted out on a 154 x 267 metre field and planted with crop seeds. When ready the grain was harvested in a giant X configuration, like a cancelled etching plate, and then sent to a gallery in Germany where it was stored for a month. For the duration of this ‘exhibition’, the distinguishing features of the gallery were changed – Oppenheim issued a new telephone number and stationery and new staff were employed. Advertisements merely mentioning ‘Grain for sale’ were placed and visitors to the space were presented with nothing other than large bags of grain and a large weighing scale. In the early 1970s Oppenheim moved away from these large productions, in which the artist played the role of project manager, to a more personal focus on the body. For example, ‘Stills from gingerbread man’ consists of film stills which documented a performance that overtly looked into the function of the body. Oppenheim first listed the ingredients, which he then used to make ginger-bread men. Having slowly eaten them, he had his intestinal tract emptied and samples of his faeces were placed on glass slides that were viewed under a microscope at magnifications of x280 to x300. 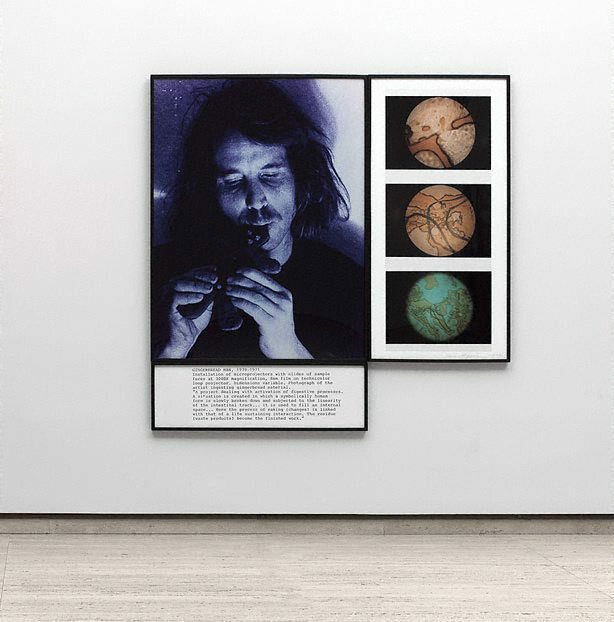 ‘Rocked circle – fear’ 1971 (AGNSW collection) was another filmed action in which Oppenheim submitted himself to the ordeal of standing in a circle, 1.5 metres in diameter, while rocks were thrown at him from above and a camera focused on his face to document his expressions of fear. These works not only took the environment and the artist’s body as the subject of the work but also used them as its materials. It is a representational process that breaks down the boundary between a thing and its representation. The performances often involved interaction with the viewers, making them responsible participants and thereby setting an agenda which permeated performance art over the next three decades. Signed and dated l.r. image [triptych], pencil "Dennis Oppenheim 1970". Michael Wardell, Contemporary: Art Gallery of New South Wales Contemporary Collection , 'Ideas and actions', pg.60-107, Sydney, 2006, 82 (illus.). Dennis Oppenheim , Milan, 1995, 78, 79 (colour illus. ).